*Please credit research when utilized, as this information has taken many years to amass. This timeline is the result of many years of research and international collaboration by the History & Archives Section within Countess Mountbatten’s Own Legion of Frontiersmen. The author’s intentions for producing this document are: first, to honour these forgotten Canadians who were motivated by the idealism of their era to serve Crown and Country; and second, to leave a “paper trail” about Canada’s and the British Empire’s quasi-military Legion of Frontiersmen. The sources and references are indicated by the author and many are housed by the University of Alberta’s Library System, or are finally available online. The History & Archives Section invites referenced critique, correction and/or corroboration of the information presented. This document allows the curious to verify sources of information, and the academic researcher can easily re-format references to meet their respective scholastic demands. No other source to date presents this amount of referenced Legion of Frontiersmen material. History and Archives Section has enabled research and the recovery of the almost lost story of the Legion of Frontiersmen. H&A Section members are aware that there is more information to be found. Section members contributing years of effort to this timeline are based in the United Kingdom, New Zealand, Malta and Canada. A substantial digital photographic archive is maintained by Dean Bruckshaw of British Columbia. Command refers to a unit that reports to Imperial HQ, and was usually a size incorporating squadrons. “Squadron” usually refers to a body that is composed of four “Troops”. In 1916 a document registered with the Alberta provincial government prescribes “Command” status as requiring a numerical strength of more than 64 Frontiersmen, 4 NCOs, 4 Lieutenants, a Squadron Sergeant-Major, and a Squadron Leader [“Legion Captain”]. A Command [also called a “Squadron”] was to be composed of Sub-units [also called “Troops”]. In reality a “Command” tended to define a geographic location and in Canada it was composed of Squadrons and Troops of members. King’s (or Queen’s) Commission is both a document and the authority to command men in the Sovereign’s military forces. Many with “commissions” have served “in the ranks” as Frontiersmen or as NCOs. As a courtesy and as an acknowledgement, the commissioned officer status may be shown in brackets. Example follows: Frontiersman (Colonel) John Smith or Frtn. (Col.) John Smith. Civil Commission was both a document and an acknowledgement from Legion of Frontiersmen Imperial Headquarters to assume a Legion Officer’s responsibility for his unit. It has no official governmental status, although it appears that in the early years of the Legion this “civil commission” was accorded some social status. A surviving copy is in the Nelson BC Archives and a more formalized “civil commission” issued from HQ in Calgary circa 1916 is deposited in the University of Alberta L.O.F. Archives. Ranks form the organizational platform used by the Legion of Frontiersmen and it is based upon the Imperial era British Army. Unique to the Legion of Frontiersmen are the traditions of elected officers and equality in the Mess and off duty. Officer status in particular must be clearly designated to the public with the prefix “Legion” or the suffix “LF”. Examples follow: Legion Captain John Smith or Captain (LF) John Smith. Today NCOs should also follow the same pattern of identifying themselves, although this was not a common practice early on. Senior Officers (Major and above) were not generally acceptable in the Legion under its greatest Chief Executive Officer, Lt. Col. D.P. Driscoll DSO. The officer rank of Legion Captain was usually the highest Legion rank allotted to a Frontiersman who did not have the King’s Commission with the substantive military rank of Major or higher. This is relevant today, as rarely do LF squadrons have the numeric strength to warrant senior officers for management. Trooper has often been used to describe the beginning rank within the Legion. Legionaire [sic] has been used especially before World War 2 (1939) to describe a member of the Legion of Frontiersmen. Frontiersman (and also Frontierswoman) is the ONLY TRUE RANK within the Legion of Frontiersmen. In the 1930s the Air Commands of the Legion differentiated themselves as an ”Air Frontiersmen”. All ranks and positions defer to the legally constituted authorities of the Crown /nation and its Armed Forces. Officers – The Legion of Frontiersmen was established early in 1905 and was originally composed to a great extent of men who had seen service in South Africa, particularly in the 1899-1902 war. It soon became a quasi-military body and as such the military’s hierarchical organization was both fitting and appealing to the membership. Frontiersmen understood that the officers of this unique organization were to be elected and that a central Headquarters carried out administrative functions. A review of early historical sources makes it very clear that pending adequate numeric strength (64 -72 persons), a rank of Legion “Captain” was the designation available by election. Majors and Colonels did exist but they appear to have usually been Commissioned Officers of His/Her Majesty’s forces with those substantive officer ranks. This point about officer status requires review as many Frontiersmen units, while still using the traditional military platform, have apparently turned their backs on the original concept regarding the assignment of senior officer ranks. Further, it was stated that peacetime units would be organized on the basis of Mounted Infantry regiments of minimum strength, the exceptions being specialized units like Maritime Branch and Intelligence units. 1904 – Founded in London, 24 December 1904. The Legion of Frontiersmen was founded in London, according to Founder Roger Pocock, on Christmas Eve 1904. Immediately following on 26 December 1904 a letter in British National newspapers suggested an organization to organize Imperial campaign veterans, adventurers, patriots and men with experience of in the world’s frontier regions. The Legion was to act as an irregular force of mounted rifles, scouts, guides, pioneers (military labourers and craftsmen with fighting ability) and especially intelligence gatherers. This new Legion of Frontiersmen was to react as a ready force until the regular Imperial forces could be deployed to the regions; or to immediately enlist if called upon. The Founder was author, adventurer, and former North West Mounted Policeman, Roger Pocock. A lack of status and rank as a gentleman in Edwardian society impeded his efforts and acceptability. He would eventually receive a commission as an older officer assigned to a WW1 Labour battalion and become an Acting Captain. In many sources this captaincy is wrongly attributed to his work as a scout in the earlier South Africa war where the rank he achieved was corporal of Irregular Scouts. Various Sources. 1905 – Inaugural Dinner. Lord Lonsdale hosted the Inaugural Dinner on the 10 April 1905. “1t was in every way a strangely mixed company that sat down to dinner with Earl Lonsdale at his town house the other evening. Cowboy rubbed shoulders with peer, miner and stockman. Novelist and soldier sat side by side, and trooper and general were at the same table.” LOS ANGELES HERALD, “Sportsmen Form Unofficial Army”, page 02, 24 April 1905. [and various other sources]. 1905 – Organizing Officer for Canada. Albert Dean-Willcocks [or name unhypenated] the “Organiser for Canada” of Montreal wrote to the RNWMP about the Legion of Frontiersmen scheme. In the reply from the RNWMP it states: “I do not think the ranchers and settlers of the North West would become willing to become members of the Legion and pay $5.00 per annum for the privilege.” The reply further states “it would be difficult to keep up interest in the Legion”. Finally the respondent for the RNWMP says, “All that could be accomplished is actually in existence to-day in our north West, except the sentimental idea of being a link in a chain of Frontiersmen throughout the British Empire.” Little else is known about Albert Dean-Willcocks [or Albert Dean Willcocks, unhypenated]; however, his and other organizers’ efforts moved on to great success, despite this first mildly negative response, culminating with official RCMP affiliation in 1936. RNWMP letter photocopies, University of Alberta L.O.F. Archives. 1906 – Legion Badge. “The successful candidates will be entitled to the use of the legion’s clubs, camps, and badge. The badge is an absolute necessity in order that men of the legion may have means of identification in places where the, are strangers, and the form suggested is a metal token of about the size of a crown piece, to be worn in civil dress under the lapel of thin coat, and in legion dress uniform on the right breast, level with any war medals. The design approved for the face is the Union Jack in enamel, charged on the Cross of St. George, with the text “God guard thee”- this being the device upon Gordon’s signet ring. By displaying the badge in places where he is unknown the frontiersman will be welcomed to the brotherhood, and can, if he so elect, attach himself to the local branch for service.” NEW ZEALAND HERALD, “The League [sic] Of Frontiersmen”, page 7, 09 March 1906. Note about LOF medallic symbols. It would appear that the precedent for wearing LOF medals on the Right breast and apart from the Sovereign’s medals had long ago been set as this 1906 NZ news article pointed out regarding the ‘’metal token’’. 1906 – “Enrolled for Sport, Prepared for War” [an early motto]. The raison d’etre of the LOF was to support the Empire in time of conflict and through training competitions maintain a needed skills efficiency. “The competitions suggested are: (a) Loading a pack horse, single-handed and double-handed, (b) From “reveille” to “march” for pack outfit, (c) Scouting for hidden treasure, (d) Long distance races, 100 miles and upwards; loss of horse to disqualify team, (e) Mr. Kipling’s scalp hunting, wherein rival units seek to take prisoners, who pay ransom to winning side, (f) Revolver shooting at walk, trot, and charge, also at moving target, (g) Rifleshooting under various conditions, (h) Roughriding, roping, polo, push-ball, and other tests of horsemanship, (i) Rough driving over obstacles, (j) Drilling a foot of rock, cutting a log, (k) Tug-of-war and lifting a gun. (I) Games played at the military tournament and at athletic gatherings. (m) Swimming (n) Ju-jitsu, boxing, wrestling, (o) V.C. and Lloyd-Lindsay race, (p) Spooring and tracking, signalling, ambuscade, farriery, and reconnaissance.” NEW ZEALAND HERALD, “The League [sic] Of Frontiersmen”, page 7, 09 March 1906. 1906 – Edmonton, Canada. The first news article noted about the Legion of Frontiersmen in the area outlines the scheme in general terms. The Edmonton Bulletin, “The Legion of Frontiersmen”, page 5, 28 June, 1906. 1906 – Assault-at-Arms Training. The preparation for war was a serious undertaking of the early Legion of Frontiersmen, be they in England or Canada. As an example from England, the fourteenth of November memorandum from Commandant Long to all commands in the Home Region invites Frontiersmen to an Assault-at-Arms contest at Manchester scheduled for January of 1907. Competitions scheduled were ju-jitsu, wrestling, weight-lifting, fencing and other military and athletic exercises. MANCHESTER ARCHIVES AND LOCAL STUDIES, File Reference: M540/1/7. 1906 – Natal Uprising. “As an instant of its alertness, the Legion claims to have been twenty-four hours ahead of the Press with the news of the rising in Natal. Its honorary organizer on the spot, Captain Gordon Huntley, rode his pet mare twenty eight miles and killed her, to wire to headquarters, “Native rising instruct”, this being the first announcement in London”. C.B. Fry, MAGAZINE OF ACTION AND OUTDOOR LIFE, Volume VI, No. 31, October 1906. Credit Geoffrey A. Pocock, L.O.F. Historian. 1906 – Natal Legion of Frontiersmen. Referring to the L.O.F. as a force, it was stated “that such men, from their special training, can be of great use to the Empire, was demonstrated by the members of the South African command, who were on the field in the Zulu rebellion of 1906 nearly twelve hours before the news of the rising reached the military authorities of the district”. AUCKLAND STAR, “Legion of Frontiersmen”, page 11, 05 June 1912. 1906 – Natal. “May 12 Services of 500 Legion of Frontiersmen Offered”. Details of the actions of the local Legion of Frontiersmen and of the 500 LOF offered are not known at this time. http://www.naval-military-press.com/pdf/1843422190.pdf “A Diary of Day to Day Operations In The Field As Told Through Official Dispatches”, page 12. 1907 – Official News Publication of the Legion of Frontiersmen. At a meeting of the Executive Council held in London 23 May 1907, the publication THE NORTHERN COMMANDS GAZETTE [“Northern Commands” meaning commands in the North of England] became the news for the entire Legion and was retitled THE GAZETTE, becoming THE FRONTIERSMAN a short time after. THE FRONTIERSMAN, “Legion Notes”, page 28, 26 June 1907. 1907 – Singapore Maritime Division. “The Admiralty has given the Legion of Frontiersmen full authority to organise a Naval Branch, and to generally equip and train men for sea service, either from a naval or mercantile point of view.” THE SINGAPORE FREE PRESS AND MERCANTILE ADVERTISER, “Singapore Rice Trade”, page 5, 08 February 1907. 1907 – Burma Maritime Division. This L.O.F. maritime division was likely started in about 1907 as was the Singapore division mentioned above. See the 1910, Burma entries of this Timeline. Arnold Wright, TWENTIETH CENTURY IMPRESSIONS OF BURMA, page 175, 1910. 1907 – First L.O.F. Commandant in Canada, Maurice H. Marsden. Sometime prior to 26 June 1907 “A command has been inaugurated at Vancouver, British Columbia, which takes rank as senior Legion Command in the Dominion, the Acting Lieutenant Commanding being Maurice H. Marsden”. Although there were claims made regarding S.W. Caws of Lac Ste. Anne, Alberta, etc. they are inaccurate. THE FRONTIERSMAN, “Legion Notes”, page 28, published 26 June 1907. 1907 – First L.O.F. Command in Canada, Vancouver BC. Sometime prior to 26 June 1907, “A command has been inaugurated at Vancouver, British Columbia, which takes rank as senior Legion Command in the Dominion…”. Although there were claims made regarding Nicola Valley, Nelson, and Lac Ste. Anne, those claims are inaccurate. THE FRONTIERSMAN, “Legion Notes”, page 28, published 26 June 1907. 1907– Second L.O.F. Command in Canada, Nelson BC Command. To date it appears that the second Canadian LOF command to formally take shape was under E.C. Wragge the Organizing Officer of Nelson BC, located in the rugged Kootenay region. His Civil Commission is Number 29, dated 08 April 1907 and issued from LF headquarters in London, England. This well documented command at Nelson BC records its first general meeting on July 01. This command’s unique file of records in Canada outlines the activities of this early era LOF command. By 1909, about 77 members were enrolled. This Command elected leaders, and intended to liaise with the 102nd Regiment of the pre-war Canadian Militia. The Nelson Command was documented from 1907 to 1914 by E.C. 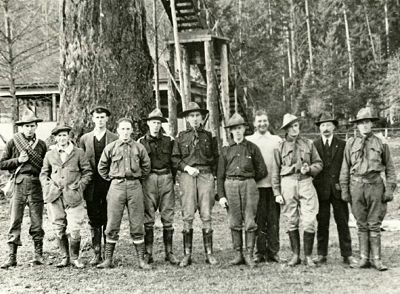 Wragge, a lawyer in Nelson, and appeared to have evolved along two distinct formations, one being mounted rifles and the other being scouts & guides. Nelson BC Archives [Copy of the file at University of Alberta L.O.F. Archives]. 1907 – Edmonton AB, Organizing Officer. J.V.E. Carpenter is noted as the Organizing Officer in Edmonton Alberta and he also becomes a captain in the newly formed 101st Edmonton Fusiliers of 1908. An Edmonton Command probably started, but it does not appear dynamic until 1914; likely due to Canadian Militia recruiting locally for both the 19th Alberta Dragoons and the 101st Edmonton Fusiliers. THE NORTHERN COMMANDS GAZETTE, unspecified pages. See University of Alberta L.O.F. Archives. 1907 – Organizing Officers in Canada. The Northern Command [UK] documents indicate that 19 Organizing Officers were active from Yukon Territory, the west coast, the Kootenay region, the prairies to Thunder Bay, Ontario. Of these Organizing Officers a very interesting figure was Judge W.B. Gray (Buckskin Billie). Born as William Brigham in 1852, he took his stepfather’s surname and later in Canada he was also known as Buckskin Billie. He trained in England to be a doctor and went to finish his studies in Winnipeg. He became fascinated with the idea of being a cowboy and abandoned medical studies to become a rancher at Pine Creek near Calgary. After different ranching experiences in Alberta he settled in Stettler and became the first Town Clerk then eventually the Police Magistrate. “Buckskin Billie” a 1907 Legion of Frontiersmen Organizing Officer, later the respected Judge Gray, died at age 94 in 1947. Unfortunately, the provincial archival records do not mention any role as an Organizing Officer of the Legion of Frontiersmen nor is there any indication of W.B. Gray forming an LOF Command. THE NORTHERN COMMANDS GAZETTE, unspecified pages. See University of Alberta L.O.F. Archives, Glenbow Museum Photo Archives, and Royal Alberta Museum Archives. 1907 – Peter Gunn MPP claims to be first Canadian Legion of Frontiersmen member. In a speech to Edmonton Command LOF, Peter Gunn MPP (Member of Provincial Parliament in Alberta) stated that he was the first Frontiersman to enroll in Canada with C.H. Dunn of Wabamun being the second. Furthermore, he stated [now known to be incorrect] that Stanley Winther Caws of Lac Ste. Anne was the first commandant in Canada. It is more likely that Gunn and Dunn were respectively first and second L.O.F. in Alberta. EDMONTON MORNING BULLETIN, Frontiersmen Are Willing To Join The Reserve Militia, 09 May 1916. [cross reference with] THE FRONTIERSMAN, “Legion Notes”, page 28, published 26 June 1907. 1907 – Stanley Winther Caws, Lac Ste. Anne AB. This early-era commandant, was recorded as Caws, Cawes, and Caus. He was a tattooed Boer War veteran and “remittance-man” (often the “black sheep” paid by the family to stay out of England) who formed the first Legion of Frontiersmen unit in Alberta. He enlisted 1914 in the 19th Alberta Dragoons in Strathcona (now part of Edmonton), transferred to the Royal Flying Corps and was killed in action. After Stanley Winther Caws was killed in action his captured crewman reported that Caws was given a military burial by the Germans. S.W. Caws has been wrongly identified as the “first Commandant” etc. due to speeches made by Peter Gunn MPP (Alberta) and a report in the 1916 Regina newspaper, as quoted: “Another noted member of the Legion was Lieutenant S.W. Caws. He was the first organizer of the first command of the Legion in Canada, and was the first commandant officer located at Lac St. Anne, Alberta.” [Legion records indicate Maurice H. Marsden of Vancouver Command was Canada’s first commandant]. SOLDIERS OF THE FIRST WORLD WAR, CEF Attestation Papers Online. REGINA MORNING LEADER, “Legion of Frontiersmen [etc. ]”, page 3, 17 June 1916. THE FRONTIERSMAN, “Legion Notes”, page 28, 26 June 1907. “Buller Butler and Stanley Caws were in the country west of Lac Ste. Anne in 1906, and may have put in squatter’s stakes on the land in the Stanger area where they later filed on homesteads, but had no shacks or houses up until well into 1907”. Caws’ kindness and generosity was illustrated when he secretly paid boarding costs of a newly arrived young Englishman who couldn’t manage the rough life of a pioneer. He paid and instructed the host to have the young man do chores for boarding costs and to let the young man feel that he was earning his board. In a fit of anger the paid host told the sensitive young man that was being supported by Caws’ generosity. Sadly, the tenderfoot committed suicide. The regional history book comments that Caws and two friends initially came to Lac Ste. Anne from a district called Rabbit Hill south of Edmonton, now within today’s large city. When they came out in winter of 1906-07 the snow was three feet deep at all times and heavily crusted by Chinook winds making it difficult for horses to paw for food. As well, horses were eaten by grizzly bears. At 11:00 a.m. on New Year’s Day 1907 the Hudson Bay Company trading post recorded a temperature of 68 degrees below zero Fahrenheit. Lac Ste. Anne and District Historical Society, WEST OF THE FIFTH: A HISTORY OF LAC STE. ANNE MUNICIPALITY, pages 29, 59, 62, 68, 195, 202, 207, published 1959. 1907 – Africa. “The first unit of the Legion of Frontiersmen was formed in British East Africa in 1907.” The Legion would remain active in the region until shortly after Kenyan independence in 1963. Baron Bertram Francis Gurdon Cranworth, PROFIT AND SPORT IN BRITISH EAST AFRICA, 2ND Edition, 1919. Note: if you would like to be informed when further parts of this timeline are posted, and other articles on this blog, please click the “Follow the Blog” button on the right hand side of the screen. You do not need to be a member of WordPress to do this. You will be prompted to enter your email address and then you will receive automated emails every time something new is posted to the blog. This entry was posted in Canada, Frontiersmen, Legion of Frontiersmen, Roger Pocock and tagged Caws, Civil commission, Command structure, First command, First member, Legion Badge, Maritime Division. Bookmark the permalink. My Grandfather A.T. Crockett was a Frontiersman in Winnipeg MB. I believe he had a rank of Sargent. Do you have any information on him or the Winnipeg force. Thank you for taking the time to read this. A set of Frontiersmen Canadian Division magazines is lodged in the Legion of Frontiersmen archive at the Bruce Peel Special Collections Library at the University of Alberta. Due to the cost, they have so far not been able to digitise these. To search these you will either have to visit the university or employ a local researcher. but his particular speciality is only pre-1920 Frontiersmen. Thank you for your reply. Albert Crockett was in the Winnipeg Troop in or before 1913.